Add strength, viability, and life to your hair. HairCycle Conditioner adds a light layer of protection, making your hair more manageable while improving thickness and maximizing shine. Also featuring a vast array of proteins and other nutrients, HairCycle Conditioner also fosters overall hair health and durability. Ideal for regular use, this conditioner is particularly suitable for growing hair after hair transplantation. 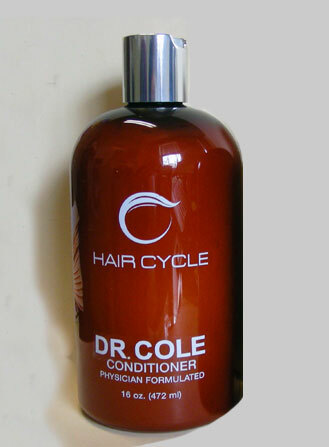 HairCycle Conditioner is best with other HairCycle line products. Each adds an array of nutritional ingredients to your hair that, in sum, complement the whole. We are particularly proud of the HairCycle Conditioner's effectiveness. Order today and find out why. Purified Water, Extracts of Seaweed, Licorice, Rosemary, Saw Palmetto and Grapefruit Seed, Aloe Vera Gel, Stearalkonium Chloride, Stearamidopropyl Dimethylamine, Hyaluronic Acid, Hydrolyzed Wheat Protein, L-Arginine, Jojoba Oil, Alpha Lipoic Acid, Alpha Tocopherol (Vitamin E), Sorbic Acid, Benzoic Acid, Peppermint Oil, Chitosan, Biotin, Azulene, Fragance.